Shape biscuits are something I have fond memories of from when I was only a little girl. We'd spend the afternoon with my Mum - cutting out various shapes from the dough, baking them, and then icing them a range of colours. My family are visiting this Christmas so I decided it would be a bit of fun to make Christmas shape cookies. 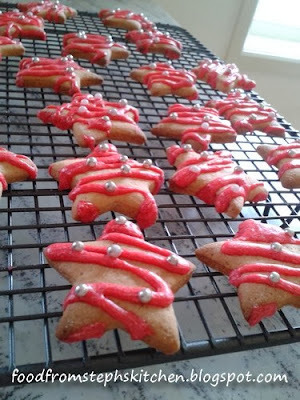 Now I hope you're not thinking fancy iced cookies that time all this time and effort to make - No, these biscuits are all about having fun with those you are baking with. It's about family! They are so simple to make, and just so much fun. 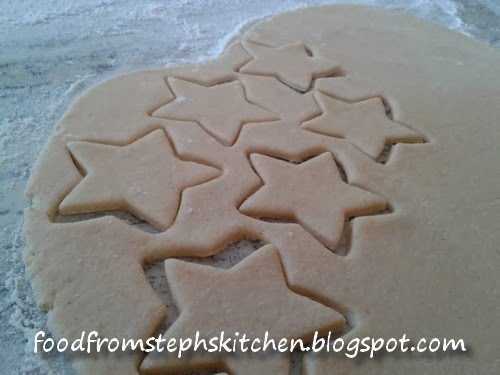 This shape biscuit recipe is an adaption from the one my Mum still makes today. The number of biscuits this dough makes depends on the size of your cookie shapes. * If you would like to make these diary free use a dairy free spread instead of margarine, and rice or almond milk instead of the milk. Cream your butter and sugar as you would for making a cake. Next add in your vanilla, cinnamon and egg, beating until well combined. Sift all three flours together before adding it into your mixture 1/4 cup at a time. About half way through adding your flour, add in the milk and salt. Continue adding the rest of the flour until it forms a cookie dough. Sprinkle a little bit of plain flour onto your bench and knead your dough until smooth. If your dough is sticking to your fingers or the bench, sprinkle a little bit more flour. Before rolling out the dough I always like to sprinkle the bench again over the area I will be rolling it out on. I find this helps later when I am cutting out the shapes. Roll out the dough to about 1/2 cm thick; with all the flour and egg in the dough they will rise higher once baked. Line a cookie tray or large baking tray with grease proof baking paper. You can simply grease the tray with something like spray oil but I find that it's easier to use baking paper. 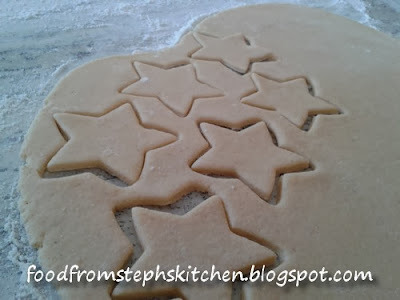 Using cookie cutters, cut out your cookie shapes one by one. A little trick that I think my Mum taught me: after pressing in the cookie cutter turn it backwards and forwards slightly a couple of times. This cuts the shape fully and makes it easier to remove from the dough. Once you have cut out as many shapes as you can, place the shapes onto your tray and lightly knead the remaining dough back into a ball. You don't want to knead the dough too much as the biscuits will be tough. You want to knead the dough only to get the dough pieces to form a ball that you can roll. 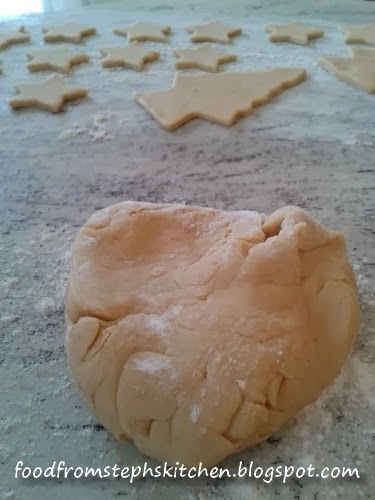 Roll out your dough again and cut out your shapes; continue this until there is not enough dough left to create another shape. At this stage I just eat the left over dough (I know terrible), but you can simply throw the left overs away. Place the cookies into the oven for 10 - 15 mins or until golden brown; how long really depends on the size of your cookies. I find that small cookies only take around 8 mins, where as larger ones needs closer to the 15. Once cooked allow your cookies to cool completely on a cooling rack. 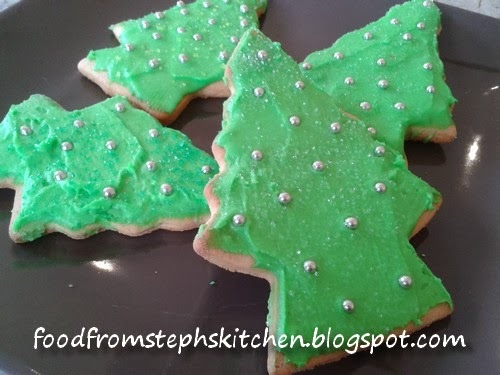 For the icing simply make a simple icing like this Easy Cookie Icing. I simply use food colouring to make whatever colours you would like. My Mum used to make one batch of icing and simply divide it into different bowls and make the different colours for us kids. The icing and decorating is the best part of these cookies I think!